Lots of photographers recommend putting a UV/Skylight filter on every lens you have, to protect the front element from blowing sand, salt, and other mishaps. This isn't bad advice. After all, once you damage that front element enough, you have to replace the lens, which will cost you a lot more than replacing even the most expensive UV filter. There are plenty of stories out there about thousand dollar lenses being saved by their "protective" UV filters. What gets overlooked too often, though, is that putting cheap glass in front of your good lens can noticeably degrade the image quality. The image below demonstrates the deleterious effects of a cheap filter on image quality. Lens is a Tokina 12-24mm f/4, at 12mm, on a Canon 60D. The scene was chose not for its artistic merit, but because it featured the sun just outside the field of view of the lens, a situation that, especially with wide-angle lens, is a recipe for lens flare. 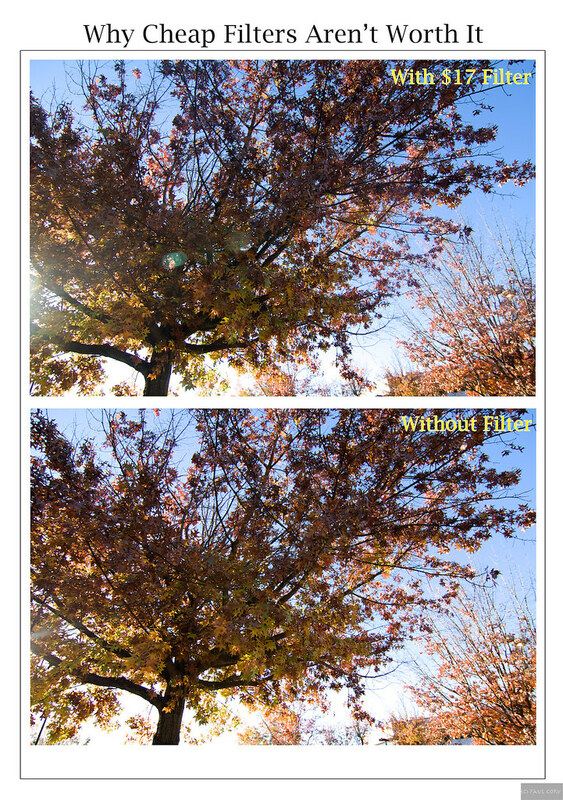 I shot first with the $17 UV filter on, and then with it off. For the second shot, I even changed the perspective slightly, in the direction of the sun, creating an even tougher flare test. The difference between the two photos is striking.